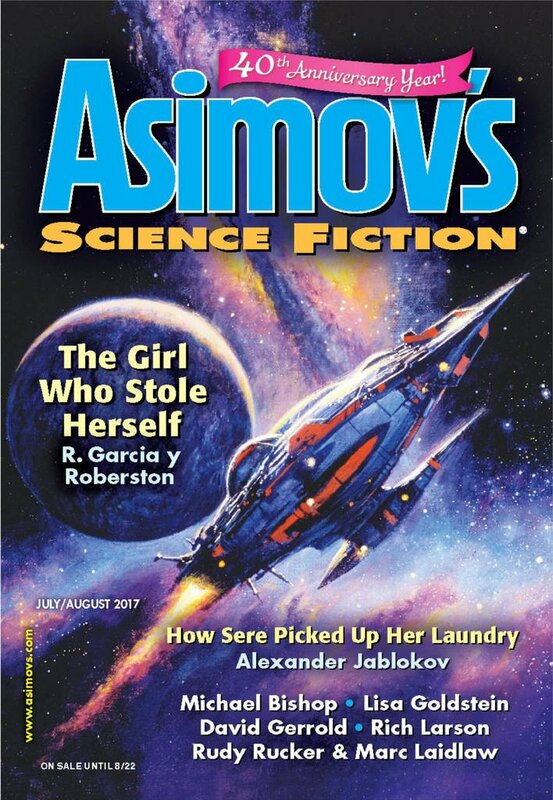 "Gale Strang," by Michael Bishop [bio] (edited by Sheila Williams), appeared in Asimov's Science Fiction issue 07-08|17, published on June 15, 2017 by Penny Publications. Pro: The story of how a young intersexed girl escapes her abusive father and finds people to love her is a sweet one, as is the story of how a lonely widow finds someone to take care of. Maggie the crow mends and returns to the world in parallel to the way Gale heals and goes off to college. It's a neat little story. Con: The magical birdcage detracts from the story, but without it, the story isn’t SFF at all.